Funny story: once, someone actually found my blog by googling for a “shoe pastry recipe”. I assure you there are no shoes called for in this recipe and the choux pastry, pronounced indeed as shoe, is quick and easy to make and not as scary as it may sound. 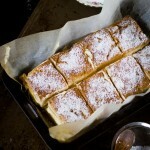 And, it’s the pastry that makes the slice my favourite from amongst other nations’ custard slices. But it has taken me two years to finally make this Polish vanilla custard slice from a recipe I was entrusted with by my cousin, a self-professed dessert queen. Her version is true to the traditional Polish recipe, named after Karpaty (Carpathian Mountains), a 1500km long mountain range in Southern Poland. Unlike the traditional French Mille-Feuille, it is made with choux pastry, which once cooled gives the slice its trademark Carpathian shapes of ridges and valleys. The filling is light and airy, not gloopy like some of the store-bought slices can be. The secret to this lies in the addition of whipped cream to the filling, which also helps to keep the sweetness in check. Having said that, the dessert is completed with a light dusting of icing sugar that ensures the sugar-free choux pastry top tastes just a little sweeter. So why did it take me that long to make it? Well, because I thought it was going to be complex and hard and it was everything but. But with only 9 ingredients, it couldn’t be simpler. All up, it took less than 20 minutes make. Except, of course, of the 25 minutes of baking and a further 20 or so of cooling the baked pastry sheet and custard in between… A piece of cake, really! And a perfect dessert to whip up and take over while visiting friends who just had a baby. I offered to bring afternoon tea along as to not burden the young parents with extra chores they surely didn’t need. I cooked it, layered it, played with the styling a little and, I confess, I ate a couple of the “rough edges” I had previously cut off – one of the perks of being the “chef”. We packed the slice tightly in a hessian bag along with the baby’s gift and set off. As I was reversing out of the driveway, I watched the bag flop to the side and, in the blink of an eye, the slice was strewn across the floor mat of my car!!! Aaaarggghhh! Well, half of it was. Aaaarggghhh! Or something close to a third more like it (Aaaarggghhh! ), because as I said I ate some of the crusts earlier. Sad face. I was not happy. I yelled at the stupid bag for falling over and expected it to understand, return home and bake me another slice! Then, anger turned into disappointed. I realised the glass, or the tin rather, was still half full though. Four of the pieces were snuggling into the safety of the longer edge of the tin, so in the end everyone got a piece. Well, everyone except for the little baby girl. She was asleep and very beautiful as we enjoyed a square of Karpatka with our afternoon cup of tea. The Polish recipe calls for budyn, a powdered custard which might be tricky to find outside of Poland, so I used thick pouring custard instead. You can bake the pastry form-free or if you happen to have a 30cm x 20cm cake tin, use that. In a medium saucepan bring water and butter to a boil. Add flour and mix vigorously with a wooden spoon until the mixture comes away from the sides and forms a ball. This should only take a few seconds. Transfer dough to a mixing bowl, add eggs one at a time and beat with an electric mixer until glossy and smooth. Grease a large sheet of non-stick baking paper with extra butter. Spread pastry into a rough rectangle until the dough is only a couple of centimeters thick. When ready, remove from the oven and allow to cool on the tray. Place cream into a mixing bowl and whip with an electric mixer until it's fairly stiff - be careful not to overwork as it will turn into butter. Place over low heat and cook, whisking, until the custard thoickens. Cool to room tempereature, whisking from time to time to prevent the skin from forming. Using a sharp bread knife, cut the pastry in half, the two sides will be yor top and bottom. Spread custard cream over one layer, leaving a 2cm edge around and top with another pressing down gently. Using a sharp bread knife, cut the slice into 8 even squares. Dust with a little icing sugar and serve. Is the icing sugar powdered sugar? Yes, icing sugar is powdered or confectioners sugar I believe. For sake of clarity I make my own my grinding up white sugar in a clean coffee grinder to a powder – so much cheaper! Thank you for the tip and your response. Your karpatka looks gorgeous! Simply perfect. 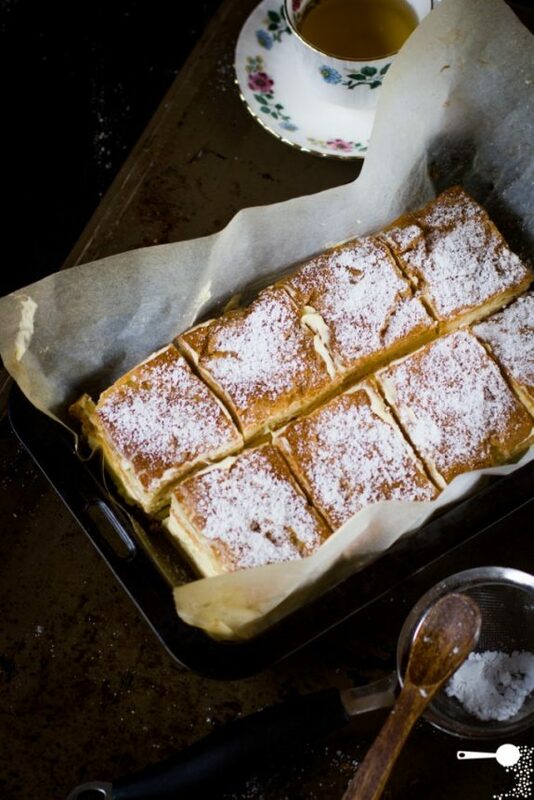 I only ever liked home-made karpatka, never bought one, so I’m sure yours tastes heavenly (I remember I even liked it served the following day, straight from the fridge, with chewy choux pastry…). I laughed so much at the “shoe” story. Hilarious! I must check more often the key words which led people to my blog too! Simply delicious! Was wondering what this dish was going to be from your instagram pic, yum! What a Nice and beautifull blog you have, love the recepie, must try it! Have a wondefull Day. Nice recipe. I love the way the slices look. This is going on file for a dessert idea for the retreat center that I work for. Yes, I’ve heard of the addition of cream to the mix but since I used to have it as a child, my cousin must have forgotten I’m over 18 now and could add a splash. Agree on butter although cream isn’t much lighter – but I thought I’d try something different 🙂 greetings back from Sydney! This looks absolutely heavenly and will have to give it a try. My mum is Polish and she’s talked for years about these wonderful custard slices that she would eat in Poland before the war … These sound so similar, but I’m sure she called them Napoleonki (or somethin similar!) I need to surprise her with a batch of these! Hi Debs, yes, Napoleonki (Napoleons) are a square single serve version of this, but generally made with sheets of puff pastry instead of puff. But I am sure she will like this version too. Czesc Ania, I think that might be it – comes in a milk carton-style packaging and is stored in the refrigerator section. Good luck! I smacznego! Pouring custard is creme anglaise. If you don’t want to make your own, you can substitute Bird’s custard or purchase a powdered creme anglaise mix, boyhood of which are available in the U.S.
That is, “both of which” not “boyhood of which.” Sheesh. Choux pastry! I didn’t know what that was – but now I see I have a recipe that has choux pastry and you’re right, it’s not hard at all and so delicious. I called mine pan eclairs because the pastry was so eggy and delicious. These look fantastic. Hi Martyna. I would think you could get the “budyn” at any Polish deli. I’ve found them here in Melbourne in various flavours. Or is it a very specific kind that is normally used.fot this recipe? Love your site by the way. I have a question about the thick pouring vanilla custard: if this pouring vanilla custard is the same than crème anglaise (which is already made with quite a few eggs), why does one have to add more eggs and flour to the custard? If I want to make home made crème anglaise and follow this recipe, then it looks like I will be making the crème twice. Any idea? Hello can you advise the amount of powdered custard as in the origianl recipe? As I have that and it would be easier for me to use. What is thickened cream? Is it heavy cream? I am in the U.S. and have never heard of thickened cream. Thank you. Hi Patty, Yes, you can use heavy cream.